This 3 CD set will teach parents, teachers and teens, grades 6 and up, how to access and use the deeper meaning hidden in folktales. 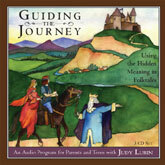 After an introductory session on the general uses of folktales, this audio program will retell the three stories found on Judy Lubin's Tales for the Journey, and then guide adults and adolescents through an intellectual journey to uncover the real story hidden below. Free Copy of Tales For the Journey Included!